FRANCE (Anatole, pseud. d'Anatole-Fraçois Thibaud). Krucyfiks kr. sw. Jadwigi, Orig. 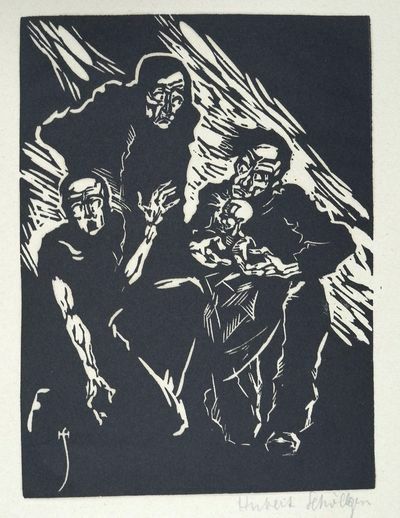 Lithografia, 1924. Renascence: A Poem . .
New York: Printed for the Anderson Galleries by Frederick and Bertha Goudy, 1924, 1924. 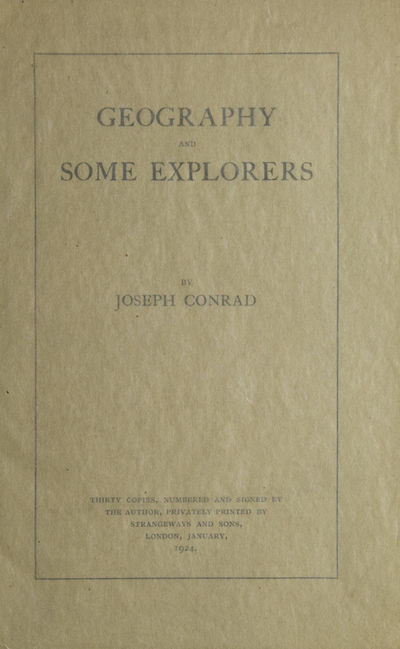 First separate edition, one of 185 numbered copies, initialed by Goudy. Yost 22. Fine copy, enclosed in a chemise and cloth slipcase.. 8vo, original pale blue wrappers, stitched as issued. A special separate issue of Millay's poem, printed by Frederick & Bertha Goudy on a handpress formerly owned by William Morris, and on which the Kelmscott Chaucer was printed. The occasion of the printing was an exhibit of the press at the Anderson Galleries, and copies of the poem were distributed only at the exhibition. Carnaval. Scènes mignonnes sur quatre notes. [Nachwort Oscar Bie]. The Works of H.G. Wells. London: T. Fisher Unwin, 1924-27. 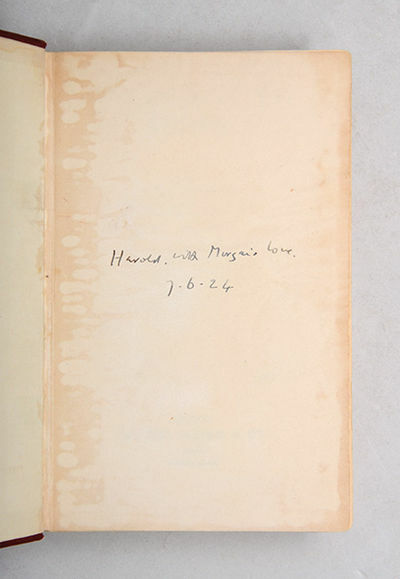 The Atlantic edition, one of 1,050 copies, signed by H.G. Wells in volume one. 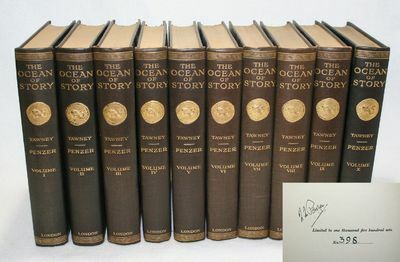 Octavo, 28 volumes. Bound in three-quarters morocco over marbled boards, gilt titles and tooling to the spine, top edge gilt. Frontispiece illustrations including author portrait in volume one. In fine condition. H.G. Wells is best remembered for his science fiction novels, and is called the father of science fiction, along with Jules Verne. His most notable works include The Time Machine (1895), The Island of Doctor Moreau (1896), The Invisible Man (1897), and The War of the Worlds (1898). Basel, 25. II. 1924. - 8vo. 2 pp. on bifolium. Comprehensive letter to E. A. Schröder in Frankfurt, speaking frankly about Schröder's literary ambitions and the inner voice a poet has to follow. PICABIA - SATIE, Erik (1866-1925). Relâche. Ballet instantanéiste en deux actes, un entr'acte cinématographique, et "la queue du chien". Scénario et décors de Francis Picabia. Cinématographie de René Clair. Première représentation par les Ballets Suédois sur le théâtre des Champs-Elysées le 29 Novembre 1924. Pearse, Pádraic H. / Éamon de Valera / Margaret Mary Pearse. Le paradis à l'ombre des épées. - Les onze devant la porte dorée. McClurg, 1924 Chicago: A.C. McClurg & Co., 1924. Octavo, pp. [1-8] 1-422 [423-424: blank] [note: final leaf is a blank], original green cloth, front and spine panels stamped in black. First edition. 10,000 copies printed. 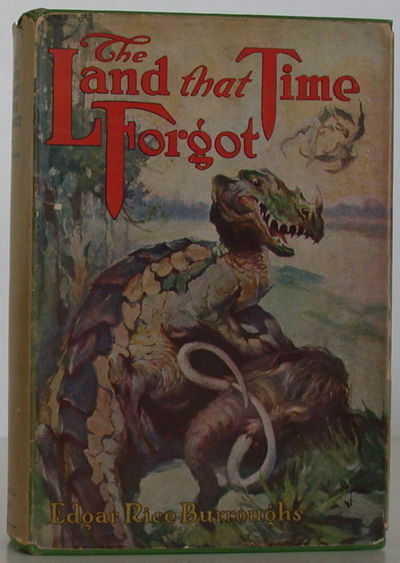 Adventure on a mysterious island inhabited by Prehistoric creatures and strange tribes of people. Anatomy of Wonder (1976) 2-28; (1987) 2-10; (1995) 2-10; and (2004) II-192. Angenot and Khouri, "An International Bibliography of Prehistoric Fiction," SFS, VIII (March 1981), 42. Bleiler, Science-Fiction: The Early Years 331. Clareson, Science Fiction in America, 1870s-1930s 110. Survey of Science Fiction Literature III, pp. 1130-34. In 333. Bleiler (1978), p. 35. Reginald 02289. Heins LTF-1. A very good copy (rubbing on bottom edge of boards and small pieces missing at bottom of spine, and two small spots on bottom page edge) in a very good restored dust jacket that is slightly trimmed. Overall still a nice example of the dust jacket. Rare in dust jacket. Enclosed in a custom slipcase. $8,000.. 1st Edition. Hardcover. Fine/Very Good. Maschinen geschriebener Brief. Mit Unterschrift.8. Februar 1924. Noche de Mayo por Alfonso Reyes. Dix, Otto. - Krieg. - "Gesehen am Steilhang von Cléry-sur-Somme". - Radierung / Strichätzung, in Schwarz, auf Crisbrook-Bütten, 1924/1983. Von Otto Dix. Auflage 1000 Exemplare. 26,0 x 19,8 cm (Darstellung / Platte) / 31,5 x 24 cm (Blatt). Karsch 97. Links unten angeschnittenes Wasserzeichen. - Abzug von der originalen Platte für die Edition "Der andere Dix" von Otto Conzelmann (Stuttgart 1983). - Originalrandiges Exemplar. Ohne jeden Mangel. Sehr guter Zustand. Otto Dix (1891 Untermhaus / heute Gera - 1969 Singen am Hohentwiel). Deutscher Maler und Grafiker, bedeutender Vertreter der Neuen Sachlichkeit. 1909-14 an Königlichen Kunstgewerbeschule in Dresden. 1914-18 Militärdienst als Kriegsfreiwilliger. 1919 Studium an der Dresdner Kunstakademie, Atelier am Antonplatz. Gründungsmitglied der "Dresdner Sezession Gruppe 1919". 1922 Umzug nach Düsseldorf. 1925-27 wohnhaft in Berlin. Seit 1927 Professor für Malerei an der Dresdner Kunstakademie. 1933 wurde er durch die Nationalsozialisten seines Amtes enthoben und als "entartet" diffamiert. 1936 Übersiedlung nach Hemmenhofen. Hodder and Stoughton, [, London 1924 - 318 x 260 mm. (12 1/2 x 10 1/4"). 197 pp. No. 111 OF 500 COPIES OF THE EDITION DELUXE, SIGNED BY THE ARTIST. 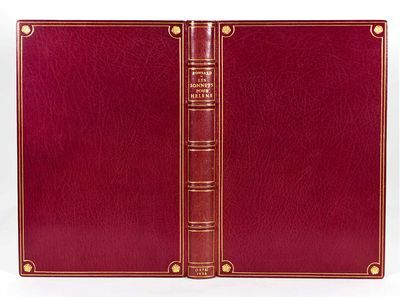 Publisher's deluxe binding of full vellum, upper cover with gilt-embossed vignette (replicating the title page), flat spine with gilt tree at foot and gilt titling at head, top edge gilt. Engraved illustrated title page, engraved tailpieces, 16 full-page black and white engravings, and 12 color plates by Kay Nielsen. Front free endpaper with remnants of bookplate. Hint of splaying to boards, gilt on spine a little muted, otherwise only the most trivial imperfections; a nearly fine copy, very clean and fresh inside and out. 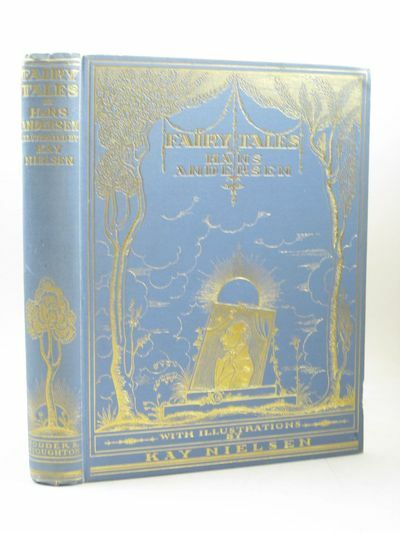 This appealing edition of fairy tales by Hans Christian Andersen is illustrated by his fellow Dane, Kay Nielsen, whose popularity during the early 20th century "golden age of illustration" rivaled that of Arthur Rackham and Edmund Dulac. Born in Copenhagen to a theatrical family, Nielsen (1886-1957) studied art in Paris, where he became quite interested in Japanese and Chinese paintings. The influence of those styles can be seen in the color plates here, while the monochrome works are reminiscent of illustrations by Aubrey Beardsley. When the popularity of extravagantly illustrated gift books began to fade in the 1930s, Nielsen moved to California, where he worked for Disney Studios, contributing illustrations for "Fantasia" and other animated films. The tales collected here include "The Real Princess" (better known as "The Princess and the Pea"), "The Snow Queen," "The Red Shoes," and "The Nightingale," Andersen's tribute to the famed Swedish singer Jenny Lind, who had gently rebuffed the lovestruck writer's advances. This appealing edition of fairy tales by Hans Christian Andersen is illustrated by his fellow Dane, Kay Nielsen, whose popularity during the early 20th century "golden age of illustration" rivaled that of Arthur Rackham and Edmund Dulac. Born in Copenhagen to a theatrical family, Nielsen (1886-1957) studied art in Paris, where he became quite interested in Japanese and Chinese paintings. The influence of those styles can be seen in the color plates here, while the monochrome works are reminiscent of illustrations by Aubrey Beardsley. When the popularity of extravagantly illustrated gift books began to fade in the 1930s, Nielsen moved to California, where he worked for Disney Studios, contributing illustrations for "Fantasia" and other animated films. The tales collected here include "The Real Princess" (better known as "The Princess and the Pea"), "The Snow Queen," "The Red Shoes," and "The Nightingale," Andersen's tribute to the famed Swedish singer Jenny Lind, who had gently rebuffed the lovestruck writer's advances. No. 111 OF 500 COPIES OF THE EDITION DELUXE, SIGNED BY THE ARTIST. Biologie und Pathologie des Weibes. Ein Handbuch der Frauenheilkunde und Geburtshilfe. Navigare necesse est. Eine Festgabe für Anton Kippenberg zum zweiundzwanzigsten Mai 1924. Hrsg. von Katharina Kippenberg. Dublin: The Cuala Press 1924, 1924. 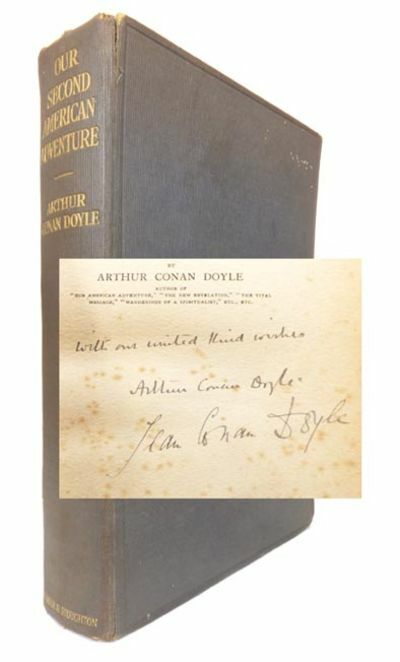 FIRST EDITION, SIGNED by the author on the title page. Slim octavo, pp. [viii], blank; [viii]; 41;  blank; , imprint; , blank. 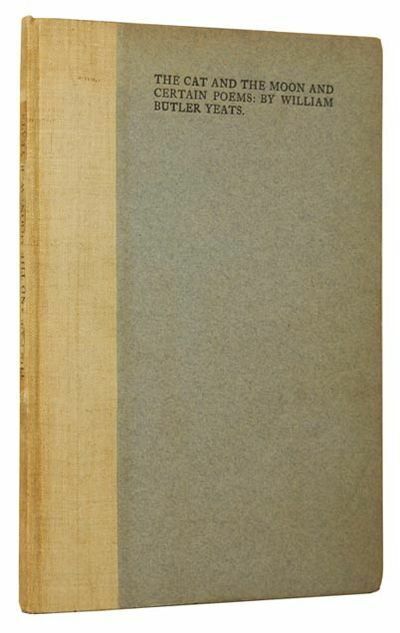 Original oatmeal coloured cloth over pale blue paper boards, titled in black, paper label to spine, pale blue endpapers. Clean text, some offset browning to flyleaves, lightly toned to extremities of binding, title label chipped. A very good copy. One of 500 printed. HERVIEU (Louise), BONNARD (Pierre), COCTEAU (Jean), DARAGNES, DENIS (Maurice), DUFY (Raoul), LHOTE (André), PICASSO (Pablo), DUNOYER DE SEGONZAC, VALLOTTON (Felix), ZARRAGA (Angel), etc. - Radierung, 1924, signiert und datiert. 17:27,1 cm. Qualitätvoller und vollrandiger Abdruck mit leichtem Plattenton auf J. Head & Co.-Bütten. Der Oberrand teils beschädigt. Sammlung &#132;NG" (ligiert), nicht bei Lugt. Als Graphiker erhielt der englische Künstler &#150; nach Abbruch seines Studiums zum Architekten &#150; seine Ausbildung bei F. Short (1857-1945) am Londoner Royal College of Art. Sein bevorzugtes Motiv war das Landschaftsbild, das direkt vor der Natur entstand. Great Western Hotel, Oban NB, 1924. One page. Somewhat smudged, split and restored at horizontal fold, but good. 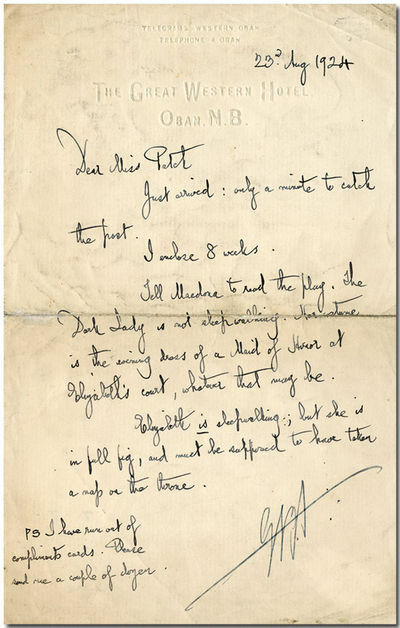 Shaw writes to his secretary, forwarding "8 weeks" salary (?) and providing instructions to be passed on for proper interpretation of DARK LADY OF THE SONNETS: "Tell Macdona to read the play. The Dark Lady is not sleepwalking. Her costume is the evening dress of a Maid of Honor at Elizabeth's court, whatever that may be. Elizabeth is sleepwalking; but she is in full fig, and must be supposed to have taken a nap on the throne ...." He requests a new supply of his compliments cards. The reference is to Charles Macdona, principal of the Macdona Players, who held touring rights to many of Shaw's plays. Messein, Paris 1924 - Paris, Messein, 1924. 8°-gr. M. farb. Art Deco-Illustr. v. Andre Cahard. 96 S. 2 Bll. Blindgepräg. Maroqiun-Handeinbd. a. 3 Bünden m. Kopfgoldschn. v. René Kieffer. (flötenspielender Pan a. beiden Deckeln). OUmschl. mit eingebunden. Nr. 59 v. 550 Exempl. Mahe III, 647.100 Blindgepräg. Maroqiun-Handeinbd. a. 3 Bünden m. Kopfgoldschn. v. René Kieffer. (flötenspielender Pan a. beiden Deckeln). OUmschl. mit eingebunden. BOHR, Niels, KRAMERS, Hendrik A. & SLATER, John C.
Milne, A. A. and Shepard, Ernest, Illus. E. P. Dutton, 1924 Signed limited edition, one of only 100 copies, also the first US Edition. Very good in a partial dust jacket. Housed in a custom-made collector's slipcase.. Signed by Author(s). Limited Edition. Hardcover. Very Good/Good. London John Long 1924. 8vo. 318pp. + 30pp ads. Publisher's blue cloth strikingly titled in black to spine and front boards, light bumping to spine ends, clean and bright, essentially a near fine copy. Internally clean. A collection of weird and supernatural tales, many with an Celtic theme. Shane Leslie was a staunch Irish Nationalist (something he partly ascribed to being bullied at Eton), and a proponent of Irish Home Rule. Leslie was also Winston Churchill's cousin (the Winston Churchill who had Erskine Childers executed for being a staunch Irish nationalist and proponent of Irish Home Rule) which must have led to some interesting dinner table debates. Leslie's writing abilities spanned a number of fields from biography through history, poetry and these rather Mabinogion-esque tales. He is also the dedicatee for F. Scott Fitzgerald's "The beautiful and The Damned." So we can be sure he led an eventful sort of existence. A truly lovely copy of a hard to find book. 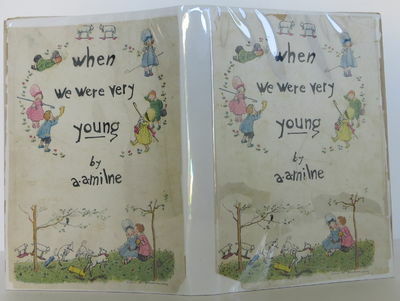 Methuen, 1924 First edition second printing (same year as the first printing) of When We Were Very Young, and first printings of the other three books in the series. Very good condition in original dust jackets. London, 1924. E.H. Shepard (illustrator). First Edition. Milne, A. A. THE POOH BOOKS: WHEN WE WERE VERY YOUNG; WINNIE-THE-POOH; NOW WE ARE SIX; THE HOUSE AT POOH CORNER. Signed. London: Methuen 1924 London: Methuen & Co., 1924, 1926, 1927, 1928. Four octavo volumes complete. Original publisher's cloth [blue, green, red and pink respectively] in dustwrapper. Gilt titles & vignettes, rules to boards, top edges gilt. Housed in a custom-made collector's slipcase.. 1st Edition. Hardcover. Very Good/Very Good. STOKES, VERNON. DOGS. 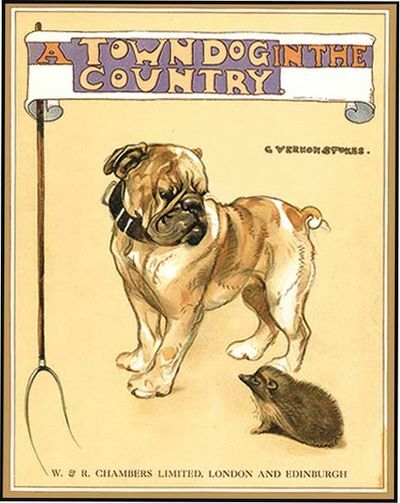 A TOWN DOG IN THE COUNTRY by Vernon Stokes. (London: Chambers), no date, circa 1924. Folio (10 x 12"), pictorial boards, narrow 1/16th inch strip of darkening on corner of some pages else Fine in dust wrapper. The adventures in the country of a wonderful "city" bulldog named Blobbs is told in verse. Illustrated by Stokes with 10 fabulous full page chromolithographs and with more full page black and whites. This is an outstanding copy rarely found so intact with the dust wrapper. London: Privately Printed for Subscribers Only by Chas. J. Sawyer, 1924. First Edition. Hardcover. Near fine. 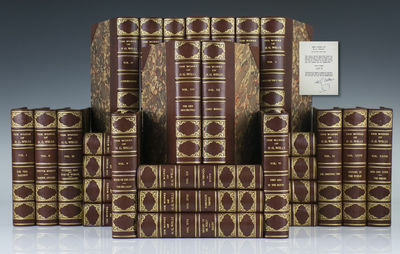 Complete set of 10 volumes, one of 1500 sets printed. Unlike the general run, however, this set is signed by Norman Penzer on the limitated page of Volume I. Royal 8vo, uniformly bound in black cloth decorated in gilt on spine and boards, top edge gilt, textured endpapers. A very near fine set, with a few lightly bumped corners and mild dust soiling to the gilt on the top edges. All volumes internally clean and tight. An eleventh-century collection of Indian legends, fairy tales and folk tales called the Kath sarits gara. Tawney's translation, first published in 1880-84, was the first complete translation in English. Penzer's edition is greatly expanded with detailed notes and commentary.